It’s now been three and a half year since this project started in February, 2013. I do this ‘year in review’ article once a year in October as that is when I started collecting statistics for these hero builds. In 2015, we achieved a remarkable feat: 100 million total subscriptions. I persevered in updating the hero builds despite the system being completely system. Begun implementing a better hero builds tooltip system and established a proper policy in what direction and emphasis I want the hero builds to go towards. 2016 was challenging in and outside the project and the public recognition for it has been the highest it’s ever been – with all of its appreciation and harsh criticism of character. 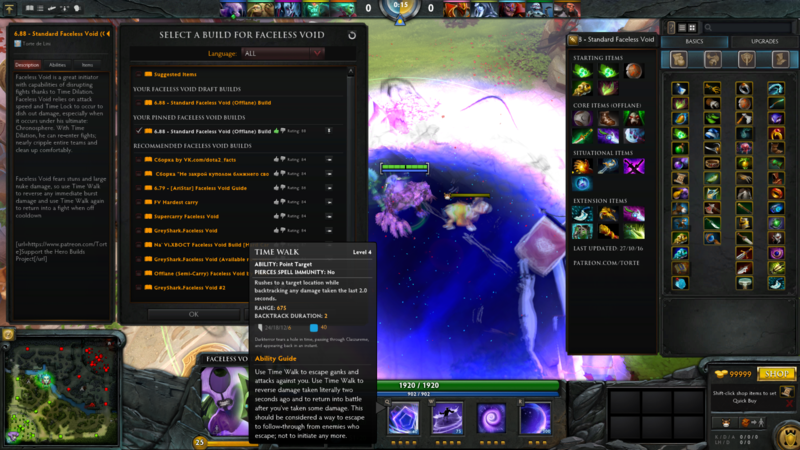 For those new to Dota 2, Hero Builds are an in-game guide system for users to learn on how to play a hero. These guides suggest in what order a hero’s ability should be leveled, which items and in what order should be bought and guides can include tooltips to give contextual value on how best to use a hero’s set of items or abilities throughout the game. This 2013 integral feature has been useful for many new players along with other Valve-released tools including the ‘coaching’ feature and robust tutorial system. This project was created to establish and maintain a ‘standard’ way of playing each and every hero in nearly all roles or forms. Today we celebrate reaching over 170 million subscriptions across 150 guides (177,425,506 as of November 17, 2016). This article will take a look at the relevant statistics of our growth, discuss the continuing motivation to maintain these guides and the future goals and challenges for 2017. In summary, this project has gained 70 million new subscriptions since last year. In fact, approximately 5 million a month since late-May 2014 (30 months consecutively). Hero builds have risen from 145 builds to 150 hero builds thanks to the release of the final DotA-Allstars hero: Arc Warden & Underlord. In October 2013, we started with less than 5 million. Since 2014, our growth has been consistent of 4 to 6 million a month. In 2015, 37 guides have reached 1 million unique subscribers individually. That number has almost tripled with now 100 guides with their own 1 million unique subs. Forecasts project that the project will achieve 200 million by February, 2017 and 234 million by October, 2017. Last year, we missed our prediction by a good margin and it might be safe to assume the same here. That said, we’ve achieved new milestones today with individual guides now breaking into the 2 million unique subscribers mark. Lifestealer, Sven, Juggernaut, Phantom Assassin, Phantom Lancer and Faceless Void have all recently hit their two million milestones and there are many other guides nearing it. Observed is the incredible growth the Sven Hero Build achieved to reach and surpass Lifestealer Build’s subscribers. Lifestealer achieved 1 million by August 2014 whereas Sven achieved similar by April 2015. By June 2016, both guides achieved two million simultaneously. Though it isn’t definitive, I firmly believe that because Sven has been more relevant in more patches and professional competitions than Lifestealer, its growth rate followed suit. This growth is not unique to a couple of builds. The average has grown from 716,000 to 1.16 million. The majority of hero builds have 1 million or more in unique subscribers. The distribution of subscribers is also much more ranged than before where guides can have as little as 150,000 subs. to as much as 2.4 million. Finished overhauling the entire hero builds item and ability texts to better denote contextual value for each. Transitioned the hero builds title system (Lane/Middle/Jungle) to less antiquated system (Core/Offlane/Jungle/Support) with sub-title specifications (Roaming, Safe Lane, Middle, etc.). 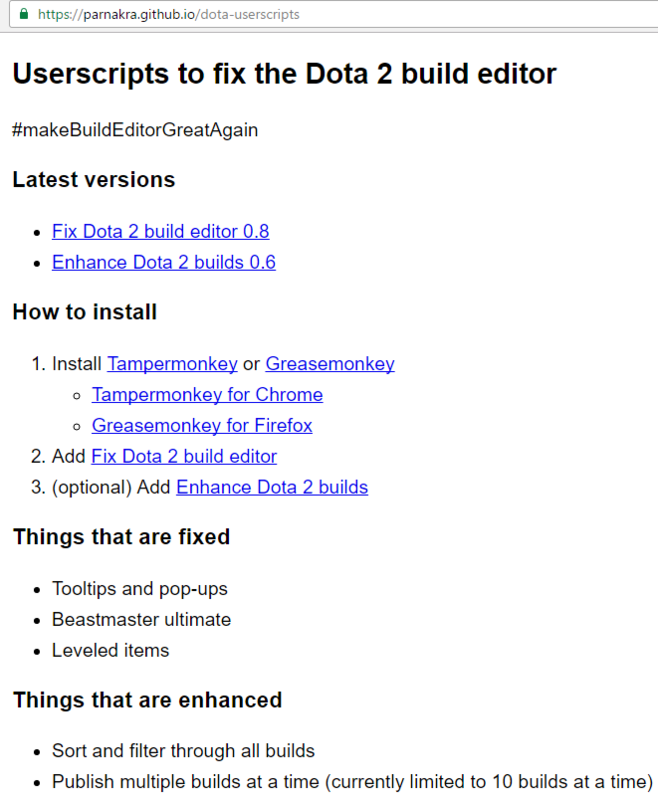 Released /r/HeroBuilds & PlayDota.com to better curate user feedback from more community hubs. After years of problems, Valve took the initiative to fix some of the most glaring issues that outright halted the ability to make and publish hero builds. Even more so, they have been very responsive in any new critical bugs reported to them. Before Valve, a user named Parnakra literally saved this project. I was on the brink of giving up before he helped not only fix the Dota 2 Hero Builds Cloud Server, but improve it in many ways. Now with a direct line of communication with Valve and their promptness in fixing any new critical bugs, I hope to see more hero builds created and updated regularly without anything preventing users in doing so. In terms of challenges, there are very few from the outside. There is still no real competition in terms of valuable hero builds currently in the database as the ones that are newly-created and maintained cannot break past some of the outdated versions from 2013 who continue to be rated up, regardless of accuracy or attention to relevance of the current patch (e.g. : heroes that get completely remade). Heroes such as Faceless Void don’t have any updated hero builds in the year 2016 except for my own. In terms of competition, the top guide creators are still the same as last year with some emerging players such as EDJE and EZ MMR. Across the board, we can see growth in all hero build collections from the most popular catalogs of hero builds. This can be indicative that there are just more or rotating new users subscribing to hero builds as a whole. In December 2015, after much hesitation, I released a Patreon campaign for users who asked how else they can support the project. Generally, feedback was always preferred, but with the support of these great people, I can start to think about expansion into other medias to help players of all kind. Thank you so much to the many people here for their generosity, support and care. They saw something that was made entirely for free and still wanted to provide support with the money they’ve earned. It’s a great honor to receive this kind of support. With the amount earned, I will be giving a portion to long-time feedbackers (though many have opted out or did not respond to request for their owed amount) and the rest will be going towards hiring a proper website designed to brand a website for the Hero Build Project and all the tools available. It will serve as a valuable hub to redirect users in being aware of all the hero builds available, tools, and statistics relevant to its growth and achievement. As always, no amount will be used for purposes other than to continue building this project. In terms of future goals, the website hub is the first immediate one. Other cloud-level dreams would be expanding to content creation, meeting with the Valve Dota 2 team to suggest a variety of quality-of-life expansion to new player initiatives and/or newbie casting (this one’s iffy – haven’t casted since 2011 in StarCraft II). In terms of motivations, 2016 turned out to be the year I receive the most recognition, appreciation, condescension and character criticism. Most of all, this year has been the most emotionally taxing where the hours of work remained consistently the same as last year’s: 2-3 hours a day, 28 to 35 hours a week and 9 to 24 hours within two days when a new patch releases. This is nothing new and I’ve made my concerns about it in the past as I juggle work, a personal life and this project. Somewhere along the way, I’ve also noticed my anonymity was lost, where I would be recognized in-game and my words, actions (or inaction) would paint how people speak to me or about me. My favourite flattery/criticism in recent times. Some others have been less than comedic and more personal. If I was overly-critical towards someone in-game, it would persist past the game and try to demonize me as some two-faced person (rather than a person who does get mad when we lose and excited when we win). If a new patch hits and I did not update the guides by their expectations, the amount of spam and private messages received would range from begging to rude demands and threats (non-lethal versions). There is a lot of expectation for me to be a public model citizen and I suppose that comes with this newly-found recognition. I do not make a living off my personality, project or appearances – yet I have this new responsibility I was not prepared for and maybe selfishly feel I do not owe towards others. I don’t think it’s something I can rebel against, but I will be taking active measures to either not talk in-game or start using an alternate account for all my day-to-day test games. Come December, I may also slow down the amount of updates and testing, as I’ve recently found myself prioritizing the project over, say, enjoying an overdue vacation with significant partners (at one point, I was updating guides while on the bus to The Grand Canyon due to increased public pressure) or ruining my sleep schedule to keep up with the latest patch. In 2017, I will also be starting something very new in my career, which may cause an impasse on continuing the project at its current level of dedication or something less attentive. Depsite this rant, I always go back and read previous topics, smile at the appreciation I receive and know there are people thankful. The numbers say it all and the words of the many drown out the negative few. Without the help from the community at PlayDota.com, LiquidDota.com and /r/HeroBuilds, this project would not be able to be even remotely as close to its goal as it is now. I would never have the knowledge, expertise or understanding of the game that some of these people have provided throughout the years and for that, I thank them for completing this project in so many ways and keeping me on top of the most glaring inconsistencies with this collection of hero builds. This project has been my pride and passion for the many years I’ve changed jobs, countries and lives. It kept me feeling personally successful no matter what low point I’ve hit. That kind of support is immeasurable and I sincerely thank you. PS: thank you James Hu, Tam Vu and Foad Ghafor for the help with the website, graphs and this article.